Growers concerned about workforce shortages in the wake of Brexit could soon have an alternative solution – robots. Pioneering work at the University of Plymouth is bringing researchers together with producers in Cornwall to create robots which could potentially work alongside their existing workforces and ensure any availability gaps are filled. 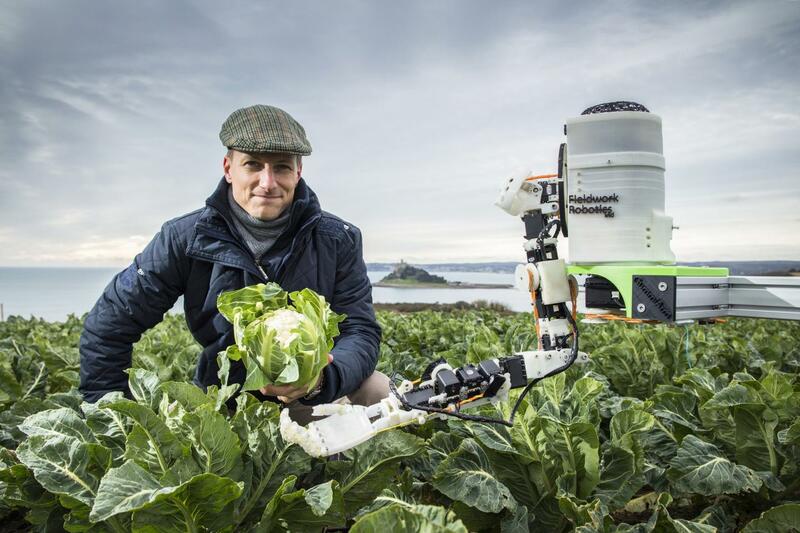 The ABC (Automated Brassica harvest in Cornwall) project is developing the cutting-edge technology to help with the cauliflower harvest – and potentially other fieldwork operations. It's being led by robotics lecturer Dr Martin Stoelen, with key agricultural expertise provided by Professor of Plant Physiology Mick Fuller. It also involves strategic partner Teagle Machinery Ltd, and partners Riviera Produce and CNC Design Ltd.
"A lot of producers are very worried about where they will get their reasonably priced manual labour from – and rightly so," says Dr Stoelen. "Manual harvesting also represents a large portion of their total costs, often it can be up to 50%, so looking at addressing that, especially against a backdrop of Brexit, is very important." His vision is to create small, mobile machines – "little helpers" – that could perform this task. With support from the Agri-tech Cornwall Project – an initiative supporting research, development and innovation in the agricultural, horticultural and food sectors in Cornwall and the Isles of Scilly – he is designing, building and testing a rig under field conditions. Through this project, and his spinout company Fieldwork Robotics Ltd, he is also exploring potential business models which would bring the technology to market within two to three years and which could involve the machines being owned by contractors, with farmers buying in the service when required. This new work will build on the successes of Dr Stoelen's 'GummiArm' robot, which has two arms and, in many ways, moves more like a human than a machine. At the heart of his vision is the concept of 'variable stiffness' – robotic arms with joints that can be made soft or stiff, depending on the task. Cameras and sensors in its "hands" can make real-time 3D models of the crop by assessing the "information" it assimilates, allowing it to recognise which parts to collect and which to leave. With such robots recording images and touch-data from all over a field in real-time, they also bring the possibility of gathering information that could be used in a variety of ways, potentially extending their application to beyond harvest. "These robots are going to be a massive big-data application. Dr Stoelen says: "Machines could even be 'repurposed' throughout the growing season, allowing the core technology to be rolled out to other operations – such as weeding or the application of pesticides. If the robot is reconfigurable, it could be relevant to other brassicas and indeed other crops. Ultimately, machines such as this will make life easier and simpler as a farmer. It's also cool technology which might encourage more young people to choose a career in agriculture. "This technology is evolving rapidly, costs are coming down and developments can happen fast which means it's not too long before technology like this becomes a practical and commercially viable reality. On a global scale, it could bring massive efficiencies and improve the industry's safety record as there would be fewer people working so closely with large, moving machinery. Agriculture has been under-estimated as a potential area for applying advance robotics, but now could be its time." David Simmons is Managing Director of Riviera Produce, which is a partner in the ABC project, and has been working in the industry for 30 years. His family has farmed at Hayle in Cornwall since the 1870s. He said: "Harvesting costs can be up to 40% of the costs of production of brassicas and skilled labour to do the harvesting is getting increasingly difficult to obtain, especially with Brexit fast approaching. In a very competitive market place where our customers demand cheap food, the cost of harvesting is continually rising. Robotic harvesting has the potential to increase productivity and control the costs." Robin Jackson, director of the Agri-tech Cornwall Project says: "Farmers have always been pioneers as far as technology is concerned, but the scale of the current challenges we face means we now need a step-change in terms of the rate at which the whole land-based sector develops and applies new technology. It will help address global issues, such as feeding the growing population and mitigating climate change, but it will also boost profit and efficiency at an individual farm level."